Fall has always been my favorite season. There is just something about it that feels refreshing and renewing, a time to completely reinvent yourself and create healthier habits. Many use the beginning of fall as a way to buckle down, get organized, and increase productivity in a means to prepare for the holiday season. But with the start of Fall also comes school, work, and all the other responsibilities that seem to pick up this time of year. Busyness can actually be a good motivator to organize and balance your life, but it can also make things a bit more challenging. Especially with the holidays right around the corner, it becomes much more difficult to maintain the healthy habits you may have set, whether they are related to health, productivity, or organization. 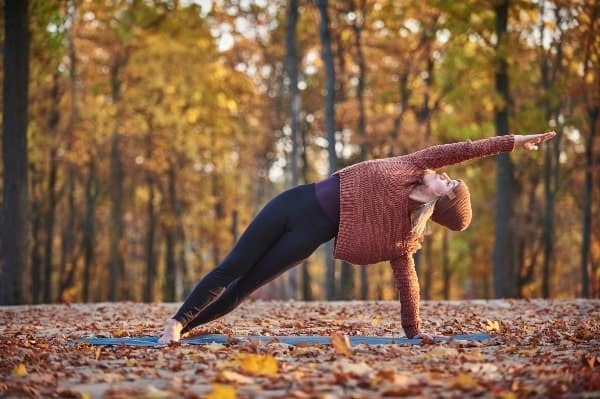 After practicing yoga for a few years now, I have learned that some poses are extremely beneficial for building strength and balance, both internally and externally. This 11 pose sequence is perfect for those of you that need that motivation to buckle down and focus on your goals, and is a great routine to practice if you just need to get out of your head for a bit. The poses require strength, balance, and most of all, patience. Practicing this routine will not only give you a good full body workout, but it will train your mind to get into the present moment and learn better focus. Go at your own pace for this sequence, make sure to hold each pose for at least 5 slow breaths. I recommend repeating it 4 times, switching sides to maintain balance, and practicing outside if possible :). 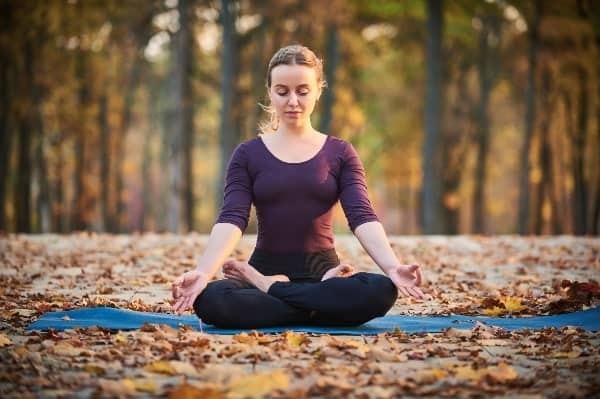 This is the pose most often used for meditation, and although it is a seated pose, it actually takes some practice and patience to get it right. I suggest warming up with a few hip opening poses like Malasana and Half Lotus Forward Fold to prepare yourself for this hip stretch, especially if you are a beginner. After you’ve warmed up, get into a simple crossed legged position, then place both feet in the crooks of your hips. 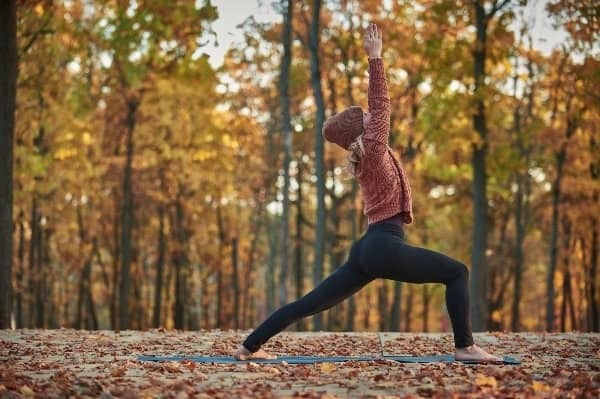 If even after warming up, this is uncomfortable for you, you can do Half Lotus by only placing one foot near the hip, or by staying in Easy Seat. Place your hands at heart space or on your knees. We are going to stay here for a few more breaths than the other poses in order to find our breath and center ourselves. Begin to count to four on your inhales and exhales to maintain a steady pace, and become the observer of your thoughts. Stay here for about 10 slow inhales and exhales. Release your feet from your hips if you were in full Lotus, and begin to slowly come on to all fours. Make sure your hands are directly under your shoulders, and that your knees are parallel to each other with your feet tucked. On you next inhale, push your hips back and up into the air into Downward Facing Dog. Make sure to engage your entire body. Extend through your arms, you spine, and you heels to create balance throughout your body. You can pump one leg at a time while straightening the other leg to warm up your hamstrings and loosen yourself up. Every time you exhale, extend more through your heels to create a deep stretch and release all the built up tension and to maintain focus. On your next exhale, lift your right leg up into the air and float it through until it reaches between both hands. First ground your front foot completely. Then rotate your back foot on an angle so it is grounded as well. Next, use your core to lift up into Warrior I. Keep your front leg bent at a 90 degree angle and make sure your knee does not pass your big toe. Rotate your hips so they are evenly facing forward. Extend your arms above your head. Keep extending through your back heel and stay grounded as you breathe. Straighten your front leg, and make sure you feel grounded in your feet and that your back in straight. Then slowly fold over your front leg, using your core. Bring your right hand to the inside of your right foot, or you can also bring it to your ankle or shin if you’re unable to reach your foot. Blocks are beneficial here if you have tight hamstrings. You want to make sure your body is completely linear to the point you would be able to fit between two walls, so make sure you are not hunching your back. After you feel your alignment is correct, lift your left hand up into the sky, forming a straight line of energy with your other shoulder. Step your lift foot up to meet your right, with feet touching. Keeping straight legs and a straight back, fold over your body. Try to touch your hands to the floor if you can, or you can also grab opposite elbows here for a nice shoulder stretch. Take this time to come back to center if your mind has become busy, and refocus on your breath. This pose may seem a bit daunting for those of you who have not mastered it yet, but all it takes is practice, focus, and patience. Once you get it for the first time, you will feel and extreme sense of accomplishment and it will make you realize just how much you are capable of! From Standing Forward Fold, bend your legs and place your hands flat on the floor, about shoulder distance apart with your fingers spread wide and grounded like suctions cups. Begin to shift the weight into your fingertips as you start to lift one foot off the ground at a time. You can bend your elbows here to help you maintain balance. Squeeze your arms with your legs and engage your core to help you lift off the ground. Keep your gaze between your hands to maintain balance. This may take you a few tries, but don’t give up! This is a great pose to help you build confidence and truly teaches you patience. The benefits are so worth the effort. From Crow, first come into a quick plank for a transition by floating your legs back behind you. Make sure your body is in good alignment before you shift your weight onto the left side of your body, and open up to the right side of the room as you lift your arm up overhead. Lift through your hips as much as your can and engage your core throughout the entire pose. Stack your legs so only the outer edge of your left foot is touching the ground. You can also come onto your elbow as a modification or you can place one knee on the ground. Right from Side Plank, instead of coming back into regular plank, flip your body upside down so your chest is facing towards the ceiling. Your alignment should be just like it would be in regular plank, just flipped. Hands should be directly under shoulders, engage your core, and extend through the legs. Make sure your hands are facing towards your feet, not away from them like in regular plank. Lift through your chest throughout this pose and let your gaze fall up overhead. Slowly lower yourself down to the ground until you are seated. Keep your legs stretched out in front of you, and come up to a straight back. Place your feet on the floor in front of you with your legs together. Keeping a straight back, start to lean back slightly until you are on your sits bone and feel your core start to engage. Start to lift one leg up at a time while you find balance until they are completely off the ground. Bring your arms straight out in front of you with thumbs facing towards the ceiling. Point your toes. Keep extending through your legs, lifting through your chest, and engaging your core throughout the durations of the pose. Lower your legs back onto the ground. Now use your core to slowly roll onto your back, one vertebrae at a time. Bring your legs into your chest, then start to straighten them into the air as you place your hands on your lower back for support. You can keep you hands on your back for support or straighten them out below you for a shoulder stretch. Keep your chin tucked in towards you chest and keep extending through your legs. Let your gaze stay on your toes. The transition from shoulderstand is actually very simple, but still requires focus on to maintain proper alignment and to resist the urge to bend your legs. From Shoulderstand, simply start to lower your feetover your head. Make sure to keep your legs straight. You don’t need to lower them all the way if you can’t do that yet. You can do this by a wall for more support by using the wall to walk your feet down further behind you. You should feel rejuvenated, focused, and centered after repeating this sequence. I hope you enjoy this routine and it encourages you to get outside and practice in the crisp, autumn air before it gets too chilly! Enjoy!